If you haven't done so already, it's time to check the exposure of companies you own to rising global trade tensions. Trump attacks Theresa May and her Brexit plan. Trump hits China again on the tariff front. The signal to investors from these latest ordeals: best start assessing the exposure of companies you own to rising global trade tensions. 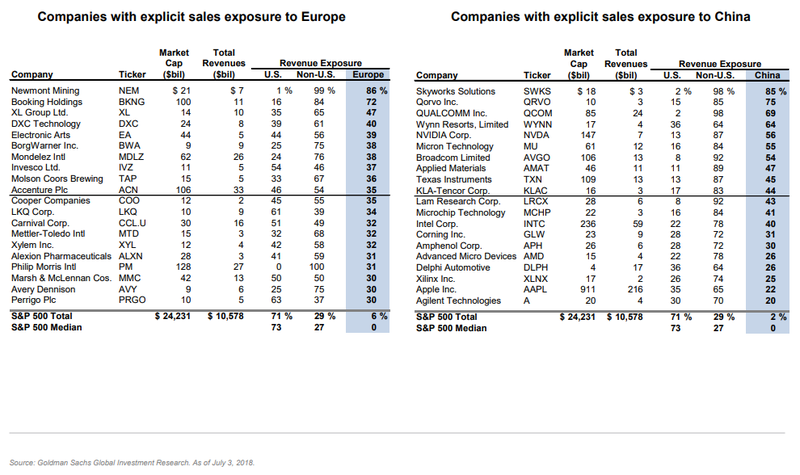 Goldman Sachs has put together a tidy list of companies (see below) with heavy revenue exposure to Europe and China. It's these companies, and others like them, that have the most to lose if trade relations really turn south this summer. Apple (AAPL - Get Report) and Nvidia (NVDA - Get Report) -- two long-time Action Alerts PLUS holdings -- are on Goldman's list. Here's why Jim Cramer and his research team remain bullish on each tech giant. Broadly speaking, Cramer thinks much of tech remains attractively valued in light of their future growth prospects. Let Jim Cramer's Action Alerts PLUS member club guide you through this market.